what a wonderful idea! congratulations! I think this is stunning! I love it! I am going to have to do this with my girls soon, before all the gorgeous Autumn leaves are gone. Thank you for another beautiful craft idea. Im going to give this a try to use as wrapping paper! Thanks! 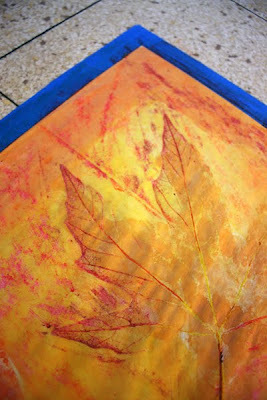 We've done leaf crayon rubbings before, but nothing on this scale, and I LOVE the final product! I wonder how long I can keep my kidlets busy with this? This is completely awesome & beautiful! Love your twists on traditional activities! 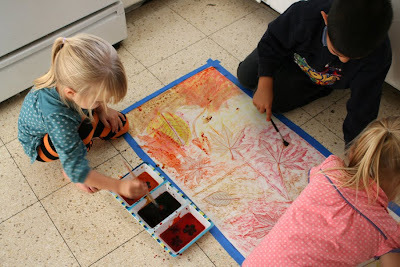 wow, it looks great, I love large scale art projects for kids. thanks! 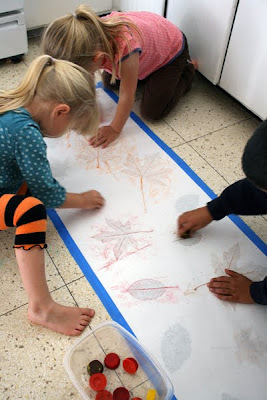 We've been trying leaf rubbings, but they just move around under the paper. taping it all down will be great! tomorrow we have a project! Wow, that is seriously cool! Thanks for posting. That looks beautiful. I'm really enjoying your blog - thanks for sharing! Very nice - it really is quite beautiful. So easy and what a lovely result! Truly striking in its simplicity. This is just a beautiful idea! If we were not in the middle of a wicked Noreaster I would get my kids out to collect leaves right now! I love this! It's one of the coolest things I've seen lately. Love the rubbings. Never would have thought of the watered down food coloring! 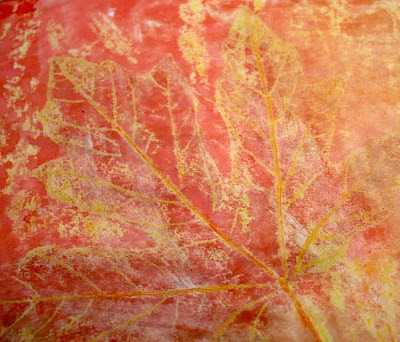 Our leaves are just starting to change, it's so late compared to what we are used to that I would love to celebrate it! What a great idea! This is a work beutiful!! A good idea! Wow, that is beautiful!! What a great fall decorating idea. Whoa...way gorgeous, I love it! thanks so much for the great idea, I'll be linking. That's beautiful! How did you hang it on your wall? It's hanging so nice and flat. Gorgeous! Love the wax resist element! Absolutely gorgeous! It looks like something you could purchase at a department store for $50 or more. Thanks so much for sharing! It's beautiful. 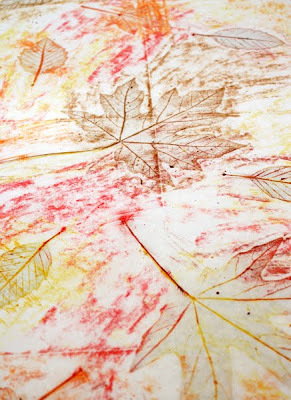 What a gorgeous way to take traditional leaf rubbings to the next level. I can't wait to give it a try! Absolutely fabulous. I wish I could have been there playing! 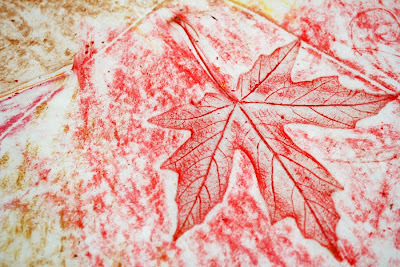 This is one of the best leaf projects I have seen this season. So simple and so beautiful when completed and hung. You have given your children a treasured memory they willnever forget. 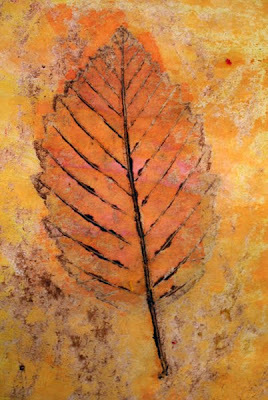 Thank you to everyone that stopped by to say they liked the leaf mural. The kids are still very proud of it. Rachel, I just used sticky tape to stick it to the wall. Not very professional I'm afraid. I was thinking when I take it down I may stick some contact paper on the back to make it last longer, and varnish the front to stop the food colourings from fading too much. Our snail art from 18 months ago was done with food colouring and that has faded quite a lot after being up in the kitchen so long. 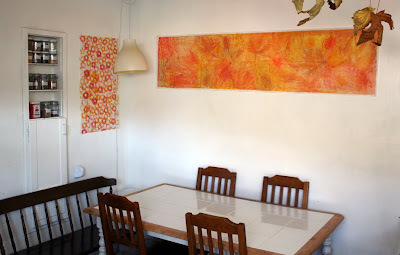 That is absolutely stunning and looks beautiful in your dining room. What a great piece of art that you can treasure for years. My daughter is too young for this now, but I'll keep this on my list of things to do. 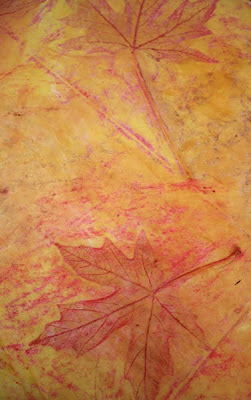 Love the leaf rubbings. Could clear contact paper be used to preserve the project? Love Love Love this. My little girl is too young for this now - but she already loves crayons and scribbling in her coloring books. I'll bookmark this post and when she's a bit older we will definitely try it. LOVE IT! Revisited this project this autumn since it came out so beautifully last year. The paper we used became brittle and got torn so I decided to try white cotton sheeting. The results are equally beautiful. 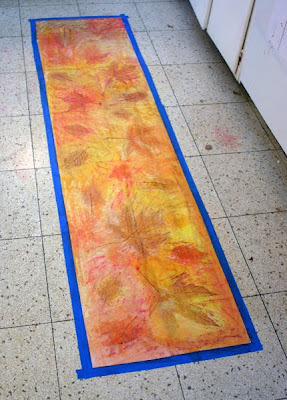 It will make a gorgeous runner for our table this Thanksgiving. how do you tape it down so well and then remove the tape so neatly? Is the blue tape the trick? I was really juiced about this idea (I had 8 five year olds over this afternoon!). Each had papers, leaves, crayons. Rubbings went fine. Then the paint... but the wax effect didn't happen almost at all! I think the problem was... these are washable crayons! I tried to write words on a page with heavy thick crayon, then paint with the watered down food coloring - and some of the letters I wrote just dissolved and disappeared. 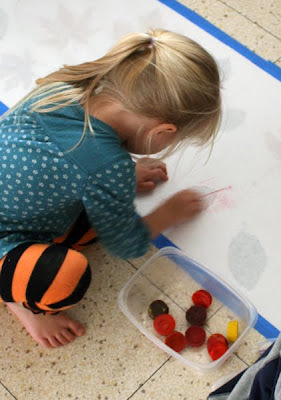 So cheap, non-washable crayons may work better here! I will appreciate, if you grab your featured button and place it some where on your blog. Thanks again for your incredible inspiration and idea. Your blog is amazing. This is beautiful! 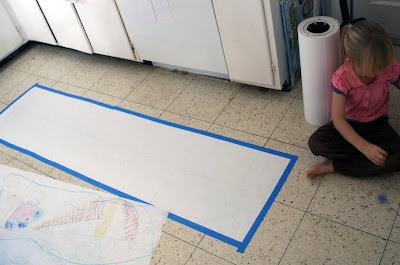 My oldest is only 3 but I think we could manage something a little smaller during naptime for my youngest. 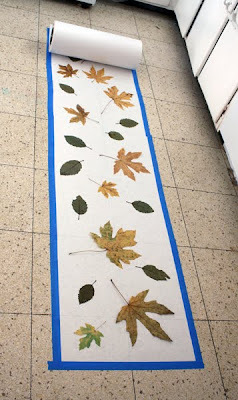 Just lovely as fall craft. My kids may just like doing this. I will credit you and send you a pic. 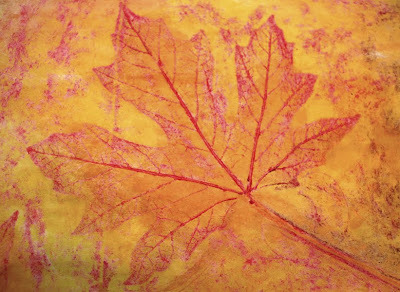 This is really beautiful and would perfectly capture our brilliant Michigan fall colors! Thanks so much for posting! Old drawing game made new. Such a great Idea! 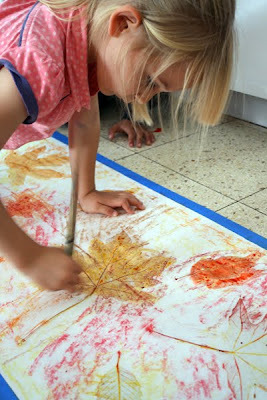 I was looking for Autumn Ideas for the first art-lessons in school an this will make it! Im not sure if I should make such a long paper as yours or if every pupil makes his own. But the Effekt will do the same!! Thank you for sharing this!